As a young man Winston Churchill strode across Edwardian England like a mythical figure. "We want our heroes to be the young Icarus, who's going to test his wings and see how far he can fly, even though his sad-but-wiser father tells him, ‘You get too close to the sun kid and those wings will melt,'" said Michael Shelden, whose new book on Churchill is released this month. "Churchill is the Icarus. He's the guy who's learned how to fly, but he can't resist going too close to the sun. And he does plummet." Churchill, the war hero, rose through the British government with a sense of destiny and a plan to be prime minister by his 40th year. The young Churchill seems marked only for success. But his political dream didn't become reality until after he failed on the national stage and was forced out as head of the largest navy in the world after the defeat at Gallipoli. "For me, now, there are two Churchills. There's the one up to 40 that I wrote about who in many ways to me seems to have died at the end of my story. He thought he was going to die. He thought that was the end of his life. He didn't think he would recover." 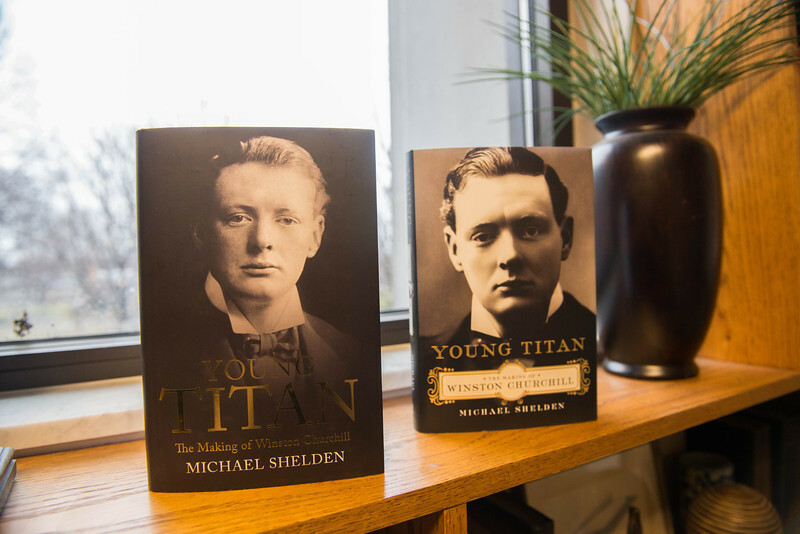 On a recent afternoon, Shelden slid a copy of "Young Titan: The Making of Winston Churchill" next to copies of his four previous books on a shelf in the Indiana State University English department office. His latest book follows Churchill from 26 years old in 1901 to 40 years old in 1915. Churchill's shadowed face stares from the cover at the reader with a look Shelden describes as "try and stop me." "It follows the rise of his career to his absolute fall, and it leaves you with the impression that this man has fallen so far that he may never get up," Shelden said. "But we know, all of us know, he did." Shelden acknowledges the oddity of his latest book. 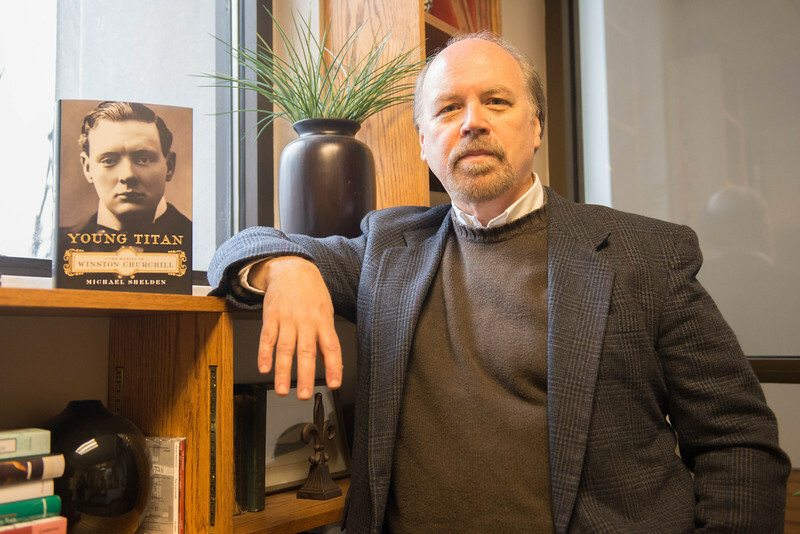 He's an American professor of English with tomes on such literary giants as Graham Greene, George Orwell, and Mark Twain, and a Pulitzer Prize nomination for his biography of Orwell. Yet, he has taken on the task of writing about a British man who's a giant in the world's history. "I love novels, but now feel, in a way, that we've been lazy with history to let the story get away from us," Shelden said. "It's so tempting just to stick with the dates and the facts and the interpretations that you forget there's that special word hiding in history, and it's ‘story'... You should first and foremost tell a story." Shelden also had other advantages in tackling "Young Titan." For about 15 years, he wrote for British publications, mainly the London Daily Telegraph, on notable personalities such as Christopher Reeve, Betty Friedan and many others while teaching English at Indiana State. He gained an understanding of British culture and people from that time. He also gained a thorough knowledge of the Edwardian era from his research for the books on Twain and Orwell. "In many ways, Churchill was more famous then, in England anyway, than he is in some parts of the world today," Shelden said. "People thought he was just an unbelievable personality and therefore he was very much in the news. All that had been forgotten because he'd been overshadowed by the leader who fights World War II." In writing about Churchill, Shelden wanted to peel back the years from the cigar-chomping English bulldog to show the pup of promise. "It's almost like walking into Pompeii centuries after the volcanic explosion. You walk in and you get your shovel and you start trying to figure out how it was to live in Pompeii before Vesuvius erupted," Shelden said. "That part of Churchill's life was buried to a large extent. I got out my shovel and started digging...The soil had covered up so much that the first guy in who gets to dig is going to uncover a lot." What he found included not only Churchill's political maneuverings, but also his romantic ones with proposals to three women that met with rejection. What he uncovered by looking "a bit to the side, to see what it is that people were missing" led Churchill biographer John Meacham to write in a review that Shelden had "...done the nigh-impossible. He has found original things to say..."
"Everyone wanted to talk about the period in the 1940s when he was prime minister, but you want to say to them, that guy didn't just show up," Shelden said. "He was the product of historical forces so you ought to go back and look at what made Churchill." Shelden made use of diaries, letters, newspaper accounts from friends and foes to recreate Churchill's world. "I want to put you in Churchill's world for a while so that you see the color of his cheeks, you hear the tenor of his voice, you feel the things he felt at that time in his life," Shelden said. "What I tried to do with this book, more than any before, is to arrange it as a series of scenes in which you see Winston Churchill becoming Winston Churchill - the man of courage and resolve, fortitude and all these great qualities." "The force of character is cumulative," Ralph Waldo Emerson states in the epigram of "Young Titan." The character that made Churchill surprised Shelden about the young man. "He was as courageous as a young man as he was in later years," he said. "Churchill is famous for saying that whatever happens you never give up, you never surrender. That was as true of him when 25 as much as when he was 65." All of a person's trials and tribulations travel with him or her and the overcoming of those problems brings added strength, Shelden said. "You are a result of all the experiences building your character. You don't just show up," he said. "Churchill brought it to his life at every point, to every test. He brought the cumulative force of this character. I think that is immensely inspiring because it says to all of us what we're doing is building something that may gather strength and purpose as we move along.... Our greatest tests may not come until very late in life and then it is who we are when we meet those tests." As an example of never giving up, Shelden points out that Churchill wooed three beautiful women. "Three women rejected heartfelt, deep efforts to say, ‘I want to marry you.' Most people do not make three marriage proposals and get rejected each time and try a fourth. Probably, the fourth time, they're thinking it's not going to happen. That's the kind of guy he was -- never, ever, ever taking no. "You could beat him up, leave him in the dirt and you'd turn around and he'd be right back up on his feet again. I've never seen anything like it." Shelden describes "Young Titan" as inspirational even though it ends with Churchill's fall from power. "It's inspirational to everyone because all of us come up against things where we think ‘I'll never make that work, I'll never succeed, it's too hard or I've put up with enough and I can't go any farther,'" he said. "And this man teaches you maybe there's more to you and more in your strength than you recognize. Maybe you should take a little bit more heart from your strengths and be more determined than you think you can be. It might work. "It's very hard to give up on anything after you've done this story." Pulitzer Prize-nominee Michael Shelden's latest book follows the life of Winston Churchill from 1901 to 1915.